But is he patting us on the back, or himself? On Friday, May 14, the day before The Preakness Stakes, Maryland Governor Martin O’Malley released a pep rally style memo to the equestrian community, a message that the equestrian community was hoping he would say to the world at large while the world’s spotlight was on us. 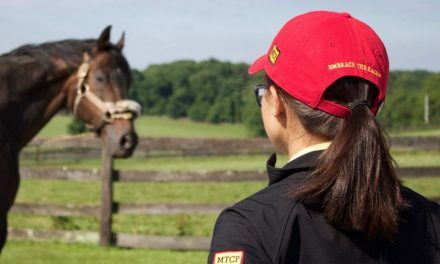 With Maryland’s best-known horse event, The Preakness, upon us and the logistics of installing slot machines ongoing, it is easy to lose sight of the horse industry’s full impact on Maryland jobs, farmland, economy and traditions. Maryland has more horses per square mile than any other state and I am committed to strengthening all aspects of the industry – recreational, competitive, breeding and racing. Some 29,000 jobs and more than 200,000 acres of undeveloped land associated with the equine sector depend upon the stability and growth of the industry. In the early months of my administration, I stood beside horse breeders, owners, trainers, grooms and others with the historic Sagamore Farm in the distance to outline our plan to protect horse-related open space, agriculture and jobs in the State of Maryland as related to slot machines. In our negotiations since then, we’ve secured requirements to maintain the number of racing days at Maryland tracks, which is critical to maintaining a consistent workforce. Keeping the number of racing days level, and possibly increasing them, will ensure steady work for grooms, exercise riders, veterinarians, farriers, saddleries, track concessions, feed suppliers, farmers who grow hay, laborers at the tracks and on training farms and many others. The first of the slot facilities is slated to open later this year, which will start to send money back into the breeding and racing sectors as well as the racetrack buildings, helping employment opportunities throughout Maryland. These funds should help to keep all of Maryland’s racetracks open for business for their real intended purpose, the great sport of live horse racing. These types of jobs are also found in all other parts of the horse industry. I saw this first hand during a visit last summer with my full Cabinet to Tailwinds Farm riding stable in Cecil County. We saw how a moderately sized stable drives jobs for grooms, instructors, feed and equipment sales and tourism visits. Shortly before that, I joined more than 300 equine leaders at the 2009 Horse Forum to identify an action plan for the future of the industry. I have received the final report with recommendations on labor, land use, marketing, horse trails and public lands, competition venues and the environment among others. We are taking up these grassroots priorities. In fact, with the support of the horse industry, the General Assembly passed and I signed into law measures that increased the funding for the promotion of the industry through activities of the Maryland Horse industry Board. In addition, we are conducting the first equine census in eight years so that we get a full and updated accounting of the size and value of the equine industry. While I am at the Preakness this weekend, I’ll be showing off our industry for all of the world to see. What many people won’t see is my tour of the stables and “backside” businesses. I visited workers here last year during the Preakness and saw for myself and through their words how these small businesses are the heart of the horse business and what keeps it ticking. It is my goal, through slots, legislation, policy and collaboration with all parts of the horse industry to see that these jobs and the open space of horse farms stay in place and help expand our economy. A recent letter from Governor Martin O’Malley to members of the Maryland horse community outlined the Governor’s commitment and actions to support the horse industry during his administration. Although the Governor’s recognition of the horse industry as an economic force in Maryland is surely appreciated, as an industry, we must honestly assess that stated support and measure action against rhetoric. An election year is prime time to flex our demographic muscle and put the power of the horse industry constituency to work. The Governor stated several accomplishments in his letter that I think need a reality check and a call for action to all candidates to ensure support for the horse industry really happens in the coming four years. Reality Check: It has been nearly four years and not a single dime of slot revenues has come in to support Maryland’s racing industry. As a result, Thoroughbred and Standardbred breeders and racing operations have moved to states which actually support the racing industry with great pursues, incentives and quality facilities. A great deal of damage has been done to Maryland’s racing industry due to inaction and mismanagement. Reality Check: It has been ten months and nothing definitive has resulted. 3. The Governor cites in his letter his support of the industry by signing into law a bill that would increase funding for promotion of the horse industry through the Maryland Horse Industry Board. Reality Check: That bill increased the tax on horse feed and is paid by horse owners, not the state. In other words, the state did not do anything; we are taking care of ourselves. 4. The Governor’s letter also mentions that “we” are conducting the first equine census in eight years. Reality Check: The surcharge/taxes paid on horse feed by horse owners is paying for the census; in other words, WE are paying for the census, not the State. 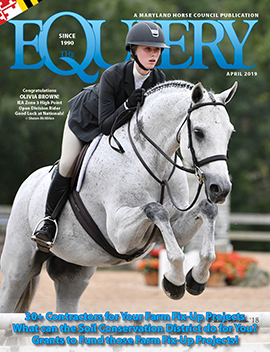 Reality Check: The Maryland horse industry today is largely comprised of the recreational and sport horse markets, and they are not represented at the Preakness. Racing is a very small portion of the horse industry today. Additionally, the conditions at Pimlico are disgraceful, so showing that to the world is an embarrassment. This reality check on Governor O’Malley’s letter is not proposed as a lack of endorsement or a political statement on the upcoming election. Rather it is meant to be a wakeup call to everyone who is involved in horses in Maryland. If you own or ride horses, or are involved with horses in any fashion, you have a stake in this election and must share in the responsibility for educating elected officials at all levels on the value, economic impact, size and scope of the horse industry in Maryland today. Reality check to US: The horse industry in Maryland is a large, economically-viable and potentially powerful constituency, but WE have to demand that respect and ensure follow-through on commitments. As an industry and a community, we need to learn to effectively flex our demographic muscles so that we get more than lip service from elected officials. This is an election year! Now is prime time to get in writing a commitment from all candidates for elected office on their support and proposed actions to support Maryland’s horse industry. And once in office, we need to be vigilant and relentless in holding their feet to the fire to make good on their commitments.